Do you have an existing RO Drinking Water System and don’t like the taste of your water produced from your RO? Most RO’s do a great job of removing contaminants but in the purifying process all the minerals are also removed leaving the water very pure, but very flat tasting “dead water”. Most people do not like the taste of RO water so typically do not drink very much water, not a good thing. RO water is very acidic without the minerals also, not a very healthy product to drink, typically from 5.6 to 6 PH. Do I need Minerals in My Water? Why do we need to add minerals to RO water you ask? Minerals are what give water it’s great taste and raises the PH up to healthy levels resulting in very pure Mineral Alkaline great tasting water. Have you ever had a drink from a mountain stream bubbling full of mineral content and appreciated how fresh and great tasting it was. Apart from the taste with the minerals in the water are the health benefits minerals add to our bodies. Typically we get most minerals from our food intake, that is if you are eating healthy fruits and veggies and not consuming lots of acidic drinks and fast food. Many people today are not eating the best choice of foods resulting in not getting minerals in their diets. Having Mineral Alkaline water simply adds beneficial minerals to your body, you can never have too many minerals. Having water that tastes great encourages most people to drink more an obvious great choice! 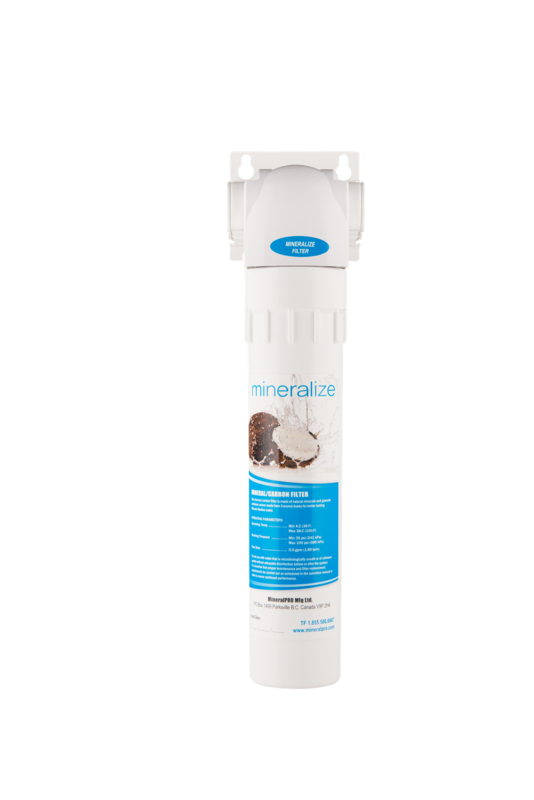 Mineral Pro has created a single stage add-on Mineral Filter which has been designed to add the minerals to your existing RO system and give you all the benefits of enjoying Mineral Alkaline healthy great tasting water! If your RO system is not too old, less than eight years old you can add this system on to your existing system. The single stage Mineral filter gets connected on the line going up to your faucet. Our single stage Mineral Filter has natural minerals in a granular form and when the water flows through this filter the minerals get absorbed into your water much the same as water flowing down a mountain stream. The minerals added are Calcium, magnesium, Potassium and other trace elements which all have great health benefits and contribute to providing you with the best tasting water you can get. If your system is an older model we recommend changing to our Mineral Pro RO system which has the mineral stage built in. Mineral Pro systems are also “Eco-Friendly” and use very little water to clean the RO membrane compared to other RO systems. Some system wastes from 4 to 10 gallons of water to produce 1 gallon of pure water. The Mineral filter also has some carbon in it which is made from Coconut husks, the purest form of carbon. This carbon puts a final polish on the water and ensures a fresh clean taste, never stale tasting from sitting in your #RO storage tank. Everything you use Mineral Alkaline water for including coffee, tea, soups and general cooking will taste way better, even your Scotch and water will be over the top! What makes MineralPro Water Taste So Good? What is Alkaline Water and Why do I need it?